While we are on the topic of bridal shows, another event that Brons and I are attending is the Lanikohunua Event and Wedding Expo 2015, located in beautiful Ko’Olina. In Hawaiian, Lanikohunua means “Where Heaven Meets the Earth”. So perfect! An outdoor wedding expo in paradise with food, drinks and entertainment, featuring Hawaii wedding vendors. Event is tomorrow, Saturday, October 17th, 5pm – 8:30pm. Tickets are $12 per adult ($10 for children 6-12) and $15 at the door. More details about the event on their website. You can purchase tickets online at TIX.com. Most of my adult life has been spent living the glamorous life for less. I love sales and deals, especially freebies. As a bride-to-be I am finding a lot of freebies available for the big day and I am taking full advantage of it 🙂 So should you! When it comes to wedding stationary, it’s important to pick the “perfect” design as it sets the theme for the entire event. First impressions last forever, ya know. Costs of save the dates, invitations, envelopes, etc.. can add up, how do you know if you are paying the right price? Luckily there are many product samples available online you can get for absolutely no charge. Here are the ones I signed up for, will share once I receive them! Select 3 Free Samples of Wedding Invitations or Save the Date cards. No shipping charges. After completing your sample order and creating an account, they will give you a Thank You code for 15% off your next order. Sample Kit includes five designs – a mix of flat, foil press, letter press and die-cut invitations, and swatches of their premium paper. You can also pick individual samples using the code 10FREE for a $10 samples credit. 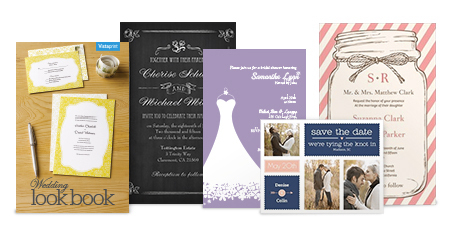 Select up to 6 Free Samples of Wedding Invitations and/or Save the Date Cards. No shipping charges. Sign up for email updates and get 20% off your first purchase. You can also request for a Free Catalog featuring hundreds of wedding supplies from invitations to customizable gifts. Sample kit includes invitation samples, color and paper swatches. Also includes a Special Offer Coupon of 20% off + Free Shipping for you and for a friend. Free Sample Kit features a look book, invitation samples in a variety of sizes and finishes and a savings coupon. Sign up while they are still available, can’t wait to get these freebies! As of today, Oct. 7th, I have ten months until our wedding. A wedding timeline is much needed as one gets closer to their beautiful day. I found some tips and printables online from websites such Marry This, Here Comes the Guide, and Real Simple just to name a few. They are different, but have general similarities in that way you’ll be prepared for what and by when. Planning a wedding can be overwhelming, but enjoy the process and the little moments as your big day will come sooner than later.